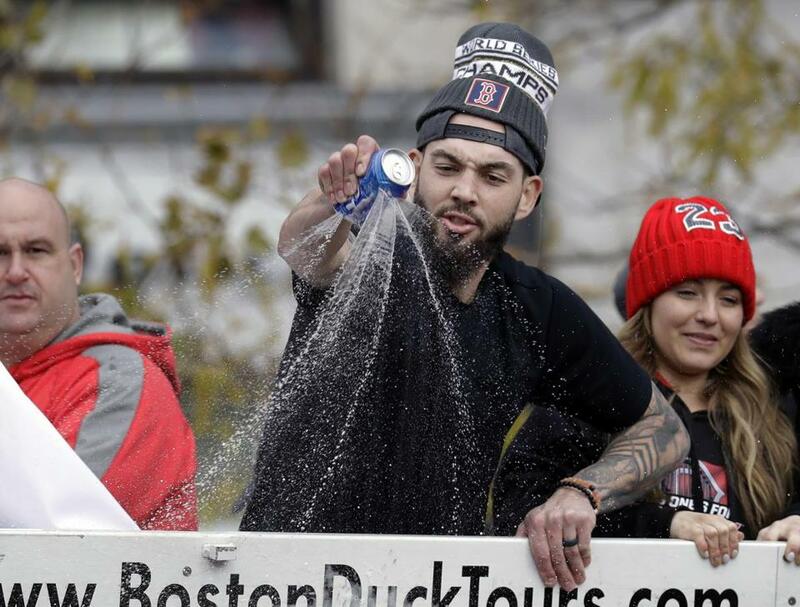 The Red Sox contended with a different type of flying projectile during Wednesday’s victory parade: cans of beer and small alcohol bottles hurled by revelers. Manager Alex Cora was pelted, and beer cans were blamed for a gash to a fan’s face and slight damage to a World Series trophy aboard one of the duck boats. Patrick Connolly, 19, of East Sandwich, was charged in the Cora incident. A law enforcement official said Cora wasn’t seriously hurt. Connolly was holding a can of beer when police confronted him, and several witnesses identified him as the culprit, records show. Connolly was among six people who were arrested at the parade, according to Boston police. A male 17-year-old was arrested in the area of West and Tremont streets and charged with unlawful possession of a firearm and possession with intent to distribute both class B and D narcotics, authorities said. Ben Carbonneau, a 20-year-old New Hampshire resident, was arrested near 3 Center Plaza and charged with drinking in public, police said. Nicholas San Antonio, 19, of Rhode Island was taken into custody on City Hall Plaza and now faces a minor in possession of alcohol charge, according to authorities. Aliza Hackingand Santina Vanasse, both 19-year-old Boston residents, were arrested near 164 Endicott St. and charged with disturbing the peace, according to police. 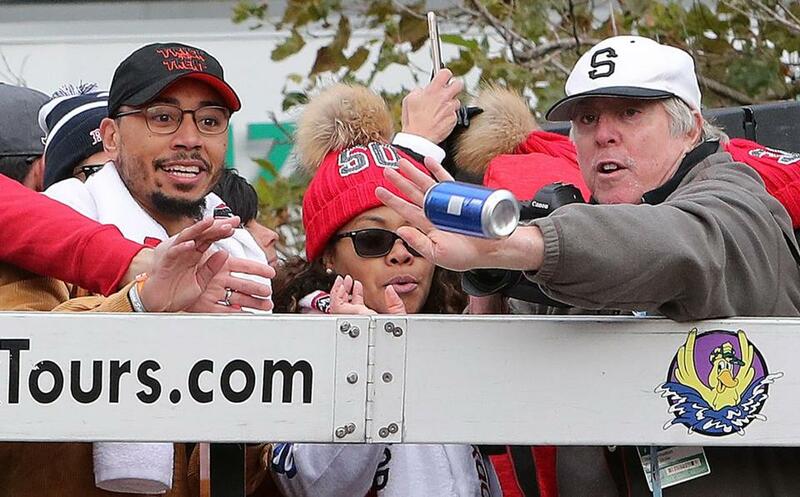 Globe photographer Stan Grossfeld, who was aboard a duck boat with outfielder Mookie Betts, said they were bombarded with beers as well as with small “nip” bottles of liquor. A video posted by WMUR-TV showed a can of beer damaging a Worl d Series trophy on Grossfeld’s boat. The trophy that was hit by a beer on Grossfeld’s boat suffered “minimal damage that’s easily repaired. Not a big deal,” Zineb Curran, a Red Sox spokeswoman, told the Globe in an e-mail. Red Sox player Blake Swihart sprayed the crowd. Globe photographer Stan Grossfeld (far right) made the save as a can of beer thrown from the crowd below was heading for Mookie Betts. 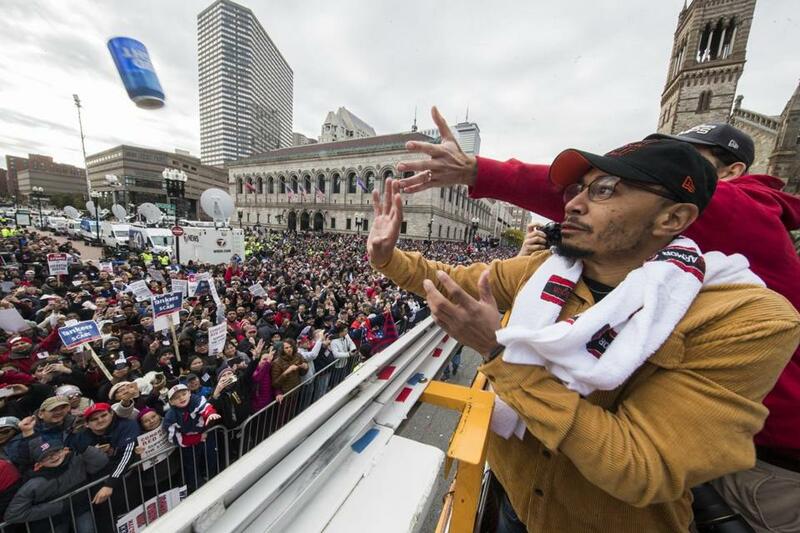 Mookie Betts reached for a beer thrown toward him in Copley Square. Connolly, who allegedly threw the beer that hit Cora, was arraigned shortly after the parade in Boston Municipal Court on charges of assault and battery with a dangerous weapon, disorderly conduct, and underage possession of alcohol. A not-guilty plea was entered on his behalf, and he was released on personal recognizance with orders to stay away from Cora and return to court for a pretrial hearing on Nov. 26. Following the arraignment, Connolly, wearing a baseball cap and a Red Sox jersey, walked out of the courthouse and did not respond to questions from reporters. Paradegoer Niamh Delaney, 20, said she got hit in the face with a can of beer, and onsite medics recommended she go to the hospital because she might need stitches. Delaney, who was standing right behind a barricade on Tremont Street, said she thought someone from the other side was trying to throw the can at a passing duck boat. “It was coming at, like, 15 miles an hour, that thing nailed me,” she said, holding a tissue up to a gash on her nose. Danny McDonald and Jaclyn Reiss of the Globe staff and correspondent Allison Hagan contributed.